Dubai: The image of bloodstains and the sound of bombs mark the childhood of many Palestinians growing up under Israeli occupation. 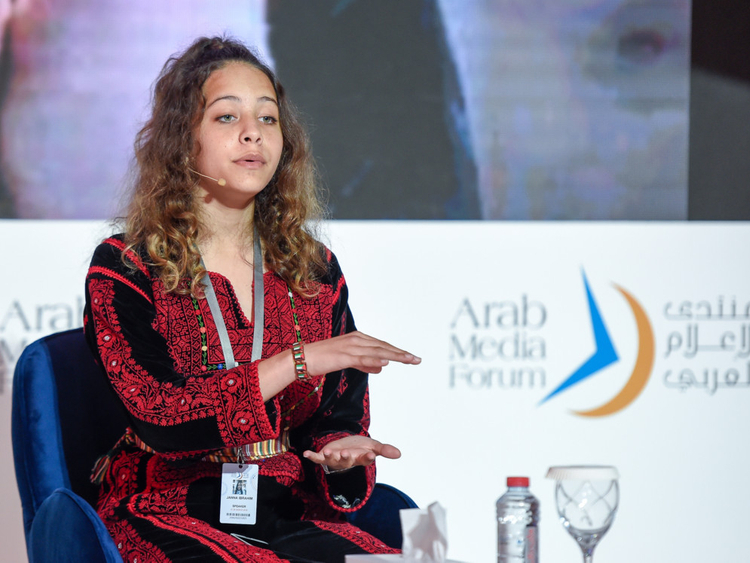 This reality is no different for 12-year-old Janna Jihad, known as the youngest journalist in the world. 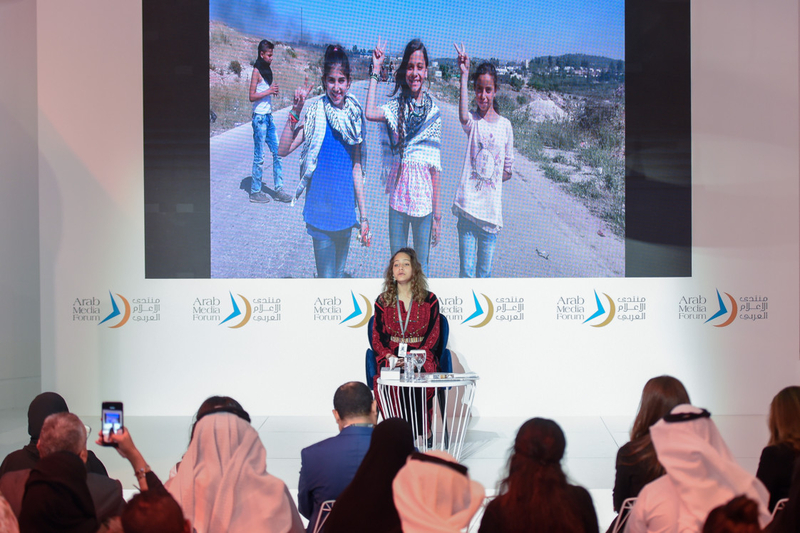 Telling her story at the Arab Media Forum in Dubai World Trade Centre on Thursday, Jihad painted a vivid picture of some of the hardest times of her life. Memories made up of moments, days and years dominated by fear, pain and the death of her loved ones. “I come from the midst of bombs, destruction, bullets, and jails, and I have been told over and over again not to do what I am doing because I will get hurt,” said Jihad, who uses social media to upload video reports from the ground in Ramallah to her Facebook followers, who total almost 300,000. Despite receiving death threats, she continues to follow what she describes as “her calling” to accurately cover the reality of children growing up in Palestine under the occupation. Recalling the cries of children and the wails of women suffocating on poisonous gas, Jihad said it was on that day that she realised it was safer for her to be on the street than at home. At the age of five, Jihad witnessed the shooting and killing of her friend Mostafa in the street by her house. “After my friend Mostafa died, I started going to the Israeli checkpoints by my house and shouting at the soldiers, asking them why they had killed my friend,” she said. She received a response in the form of sneers and mockery as the soldiers took pictures of her before eventually breaking into her house and destroying everything they could see, including her toys. They arrested her relatives and just like that Jihad was placed on their radar. Shortly after, Jihad’s uncle was killed. She remembers her uncle Rushdi sitting under a tree across from her house, often gathering the children for story time. “I got a very strong feeling after my uncle’s death and began taking part in the weekly demonstrations against the occupation. I remember the streets turning red and that is when I decided that there is a message that needs to be delivered to the world,” she explained. Jihad picked up her mother’s phone and began recording everything she saw on the streets. She confronted soldiers and reported on the jails and destruction taking place and affecting the childhood of whole generations. After several weeks of reporting, Jihad’s mother decided it was time to upload her daughter’s videos for the world to see. Jihad received several threats through messages including pictures of her house and route to school. “They tried to zip my mouth in many different ways … but I am not afraid, I have a target and I will fulfil it, and make sure the message of the Palestinian children reaches the world. The camera is my weapon,” she said. Unfortunately, shortly after Jihad witnessed another shooting — the killing of her cousin Eiz. On June 6, 2018, Jihad woke up to look outside her window in time to see Israeli soldiers shooting her cousin as he walked home. Describing it as one of the worst moments of her life, Jihad watched her cousin’s blood smeared on the ground with splashes on the windows and the walls, as the soldiers held his body in a van for over eight hours. Gulf News spoke to Nawal Tamimi, Jihad’s mother, who said she fears for her daughter’s life but has faith that God will protect her. Despite a difficult childhood, Jihad says she will continue to be a journalist, and hopes she can achieve some of her other dreams of becoming a fashion designer, a painter and a footballer. “The war and the occupation has affected the personalities of the children of Palestine. It stole our childhood and forced us to mature a lot quicker,” said Jihad. “This isn’t necessarily a positive thing, but at the same time our parents have ingrained in us strength and the will to fight for what’s ours,” she added.